Well, it looks like my time working as an exchange staff is nearing its close. I still remember my first day at Hiroshima when I just disembarked from my overnight bus from Kyoto at 6am in the morning. 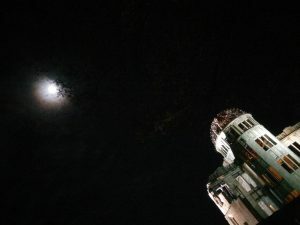 I felt very tired since I was running on 2 hours of sleep that night and also felt a sense of loneliness as I didn’t know a single soul in Hiroshima. However, that all changed quickly a few hours later once I set my foot inside Evergreen Hostel. A seasoned Evergreen hostel staff by the name of Yasu greeted me: Chapman? I immediately looked up and there I saw Yasu greet me from Evergreen hostel. A sense of belonging entered through me as soon as I entered the building. Overall, it has been a really fun month working at Evergreen hostel and it was capped off with a TV feature by a local Hiroshima station called TSS (Shin Hiroshima Telecasting) to end my work term. I can’t believe that I got to film with Ryuji Sainei who used to play the red ranger in the Japanese version of Power Rangers. Needless to say, I felt extremely unnatural since it was the first time for me to be in front of a professional TV set so I hope it will turn out well when the segment is set to debut in March. In total, I have spent five weeks living and working at the hostel. We get all types of different people here ranging from short term travellers to those that stay for weeks. I’ve even become good friends with some of the guests so that was cool. There are some points that I want to touch on which are the people, food, location and the highlights of Hiroshima. Overall, the people at Evergreen family have been exceptionally kind. I can’t say enough good things about the people who run and support the hostel. It may not be the flashiest hostel but the owner Hazuki and the others genuinely care about providing an exceptional service for the customers which is what ultimately matters in the end. Although Hazuki just gave birth to her new son, she was always quick to answer any questions that the staff had pertaining to the job. The supporters or “cheerleaders” of the hostel were also very kind to us. We had an Okonomiyaki night held by Jun-san and I would say he is more than qualified to open his own Okonomiyaki shop after tasting it. I also met Jenni who has been an Evergreen staff for several months already and her story about how she ended up in Hiroshima inspired me a lot since it has been a dream of mine to be living in a foreign country. It has to be said that the main ingredient to make a city great are the people and my experience at Evergreen hostel helped fulfill this requirement. One word: Okonomiyaki. This was by far my favourite dish in Hiroshima and fortunately for me and also the rest of those who stay at Evergreen, there is an exceptional Okonomiyaki restaurant right next to the hostel called Tecca. 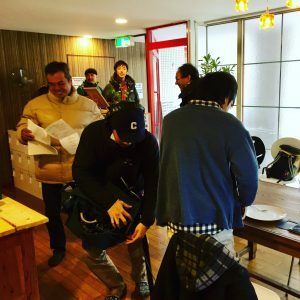 There were several occasions where I encountered some of our guests at Tekka(鉄華) and then we would talk with each other to break the ice over some delicious Okonomiyaki. 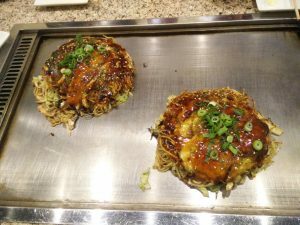 If Okonomiyaki is not your thing then there are a lot of different options found in the main area of Hiroshima. 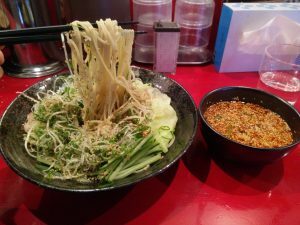 I particularly enjoyed Hiroshima’s signature tsukemen (dipping noodles) which is served with lots of spring onions, sesame seeds and cucumber alongside the spicy sauce which can be adjusted on the scale of 1 to 10. I remember getting destroyed by just a level 5 on the scale of 10 the last time I tried spicy noodles in Japan so I learned my lesson and started small this time. Living at the center of Hiroshima city was perfect for me since I could get to everywhere I need to by foot. The hostel is located just 5 minutes away from the Atomic dome site so I pass by it every day. Every time I walk past it, I always reflect about what peace means to me. For example, even though we live in the most peaceful time in human history, we cannot take this peace for granted and must pressure our leaders to abolish nuclear arms. I admire the will and spirit of Hiroshima for having the strength to recover from such a horrific event. It was also very nice to have the beautiful peace memorial park located near the hostel so it’s always nice to go for a stroll there even though I don’t have any specific thing to do. 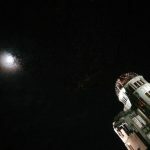 There was one night when I went with the guests at the hostel for a walk around the park and then we got to talk with a nice man who was filming a time lapse for NHK. He told us that his grandfather survived the atomic bomb so it was inspiring to hear his story. Having the hostel located near the must-see spots in the city definitely allows you to immerse yourself with the area. I would have to say that the highlights of my time at Evergreen hostel are the people I’ve met and my trip to Miyajima island. I was fortunate enough to encounter snow on top of Mount Misen located on the island. It was absolutely gorgeous up there but you will have to go there yourself to experience it for yourself. It doesn’t always snow in Hiroshima so I was fortunate enough to be a witness. In closing, I am one-hundred percent sure that I will visit or even live in Hiroshima one day. For now, I will return to my previous home in Otsu and await for the spring time to come. Thank you to all the wonderful staff at Evergreen and also to all the amazing guests who chose to stay here. Until next time folks.